Traveling Tuesdays #23 is heading to a country starting with the Letter “T”. 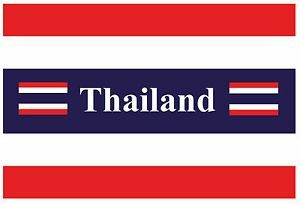 We are going to Thailand. 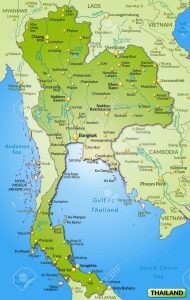 I have been to Thailand on three occasions while teaching in Kuwait. 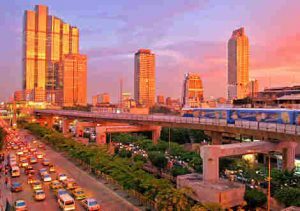 Each time I flew into Bangkok, the capital city. 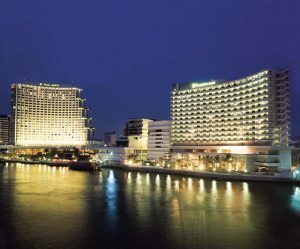 The first trip we were in Bangkok and Pattaya, the second and third trips I was there for the NESA Teachers’ Convention held at the Shangra-La in Bangkok. 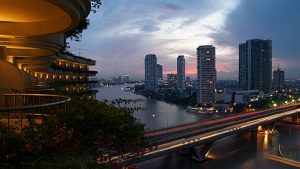 There are many interesting things to see in Bangkok. 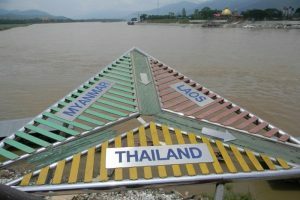 On the first trip visiting one of the floating markets was definitely a unique and exciting experience. 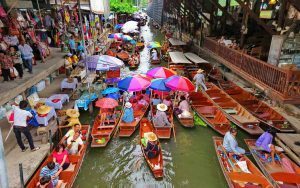 The Damnoen Saduak Floating Market is the most famous of them all. One needs to visit this market early in the morning to avoid the peak hour. 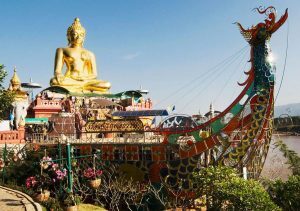 On the first trip to Thailand, I had arranged a timeshare exchange, and so we headed to Pattaya which is just 150km from Thailand’s capital city Bangkok. 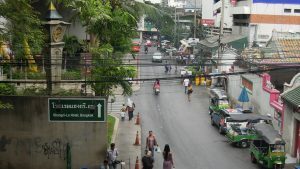 The most popular beach in the city is Pattaya beach. 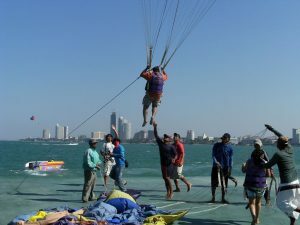 Here we enjoyed a First Time Experience – Parasailing! We were taken by boat to a barge, where we were strapped into a parachute. The parachute was attached to a motorboat which lifted you up into the air and you got to sail around the barge over the water. The whole trip lasted about 90 seconds and I think I held my breath the whole time! I wish we could have done it again so I could relax and enjoy the adventure! 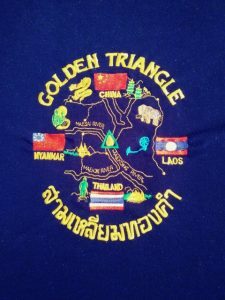 On the third trip to Thailand, I arranged to travel to Chiang Mai and had the chance to visit the Mae Tang Elephant Park. 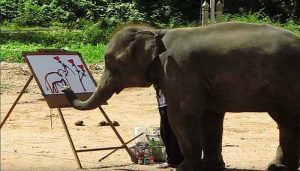 This elephant is painting a T-shirt which will then be sold to raise money for the park. I went to the local bus station and booked a seat on a bus traveling from Chiang Mai to Chiang Rai. The journey takes about 3 to 3.5 hours to travel a route of about 200 km. The bus I took was not an air conditioned tourist bus! This lower class bus was definitely a cheaper fare and not as comfortable as one might of liked. But I was determined to enjoy the adventure and I did a lot more smiling than talking, while riding with the locals through the beautiful scenery and hilly landscapes on roads that were in need of repair. 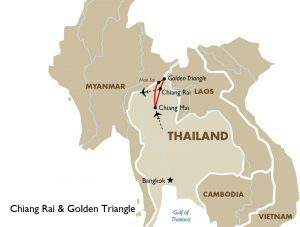 In Chiang Rai, I met up with my sister’s friend, who was working nearby, and she arranged a driver to take us to the border of Thailand, Myanmar, and Laos. 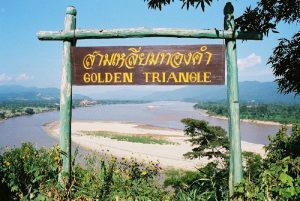 This place is called the Golden Triangle. I bought a T-shirt at one of the souqs near this sign. I still have that shirt to this day! Here is a picture of the design on my T-shirt. 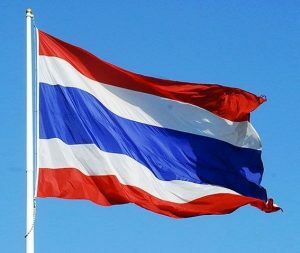 There are many things one can share about Thailand. This week’s Traveling Tuesdays Episode does not allow me the time or the space to answer all your questions about this beautiful country and the land of smiles. I guess you will have to travel there one day and see it for yourself. Be sure and come back next Tuesday as we travel to a country starting with the letter “U”.